Uranium prices halt Sandy Desert Project THE most likely of Australia's next big uranium mine developments - the Kintyre project in Western Australia's Great Sandy desert - has fallen victim to sluggish demand and prices for the nuclear fuel, and WA's "hot" construction market for resource projects. Project operator and 70 per cent owner, Canada's Cameco, has revealed that the economics of the project are "challenging" in that a development would not be profitable at current uranium prices. Prices are 34 per cent below where they need to be for a viable project. The sluggish demand backdrop has implications for BHP Billiton which must find a home for the additional uranium it will produce with the planned $30 billion expansion of its Olympic Dam copper/uranium/gold mine in South Australia's outback. The expansion would see uranium output at Olympic Dam grow massively from 9.6 million pounds a year to 40.6 million pounds a year - 17 per cent of forecast global mine output in 2020. But the Weekend Australian revealed that BHP plans to defer a decision on the project for two years. Sluggish uranium demand has already reported to have led to BHP becoming disinterested in moving towards developing its Yeelirrie uranium deposit in WA. Cameco chief executive Tim Gitzel told analysts that Cameco was "not going to develop Kintyre at any cost." An eventual development of the mine is dependent on improved uranium prices, or a substantial increase in the project's resource base. A recently completed prefeasibility study in to a development confirmed the challenging economics. It means that Cameco and its 30 per cent partner, Japan's Mitsubishi Development, will not begin development of what would have been WA's first uranium mine in early 2014 as first planned. A 2014 start to production would have meant first production in 2016. 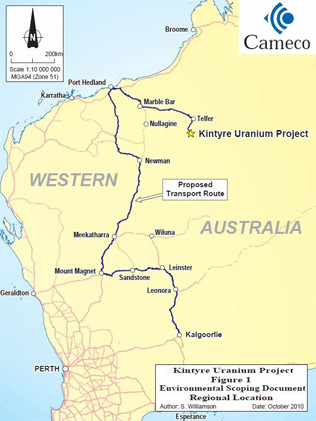 Discovered more than 25 years ago, the contemplation of Kintyre's development only became possible with the election of the pro-uranium mining Barnett government in 2008. It was in the same year that Rio Tinto, struggling to raise cash in the wake of the global financial crisis and its ill-timed acquisition of Alcan, sold Kintyre to Cameco/Mitsubishi for $US495 million. Cameco said that despite Kintyre being one of the world's biggest undeveloped uranium deposits (59.7 million pounds), a planned 7-year mine life that would recover 40 million pounds of uranium faced challenging economics "current uranium prices" and because of "continued cost escalation" in WA. "To break even, the prefeasibility study indicates the project would require an average realised price of about $US67 or about 62 million pounds of packaged production using a uranium price similar to today's spot price ($US50 a pound)," Cameco said. Cameco said it would now set out to improve overall project economics by stepping up exploration to increase the resource base. 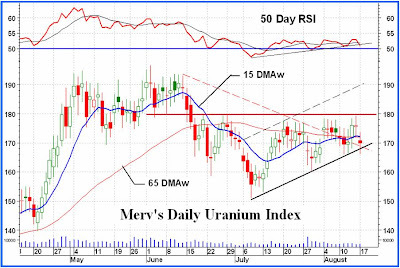 "We continue to have a positive view of the long-term fundamentals of the uranium market and want to ensure our assets are ready to respond when the market signals new production is needed. We expect a feasibility study would take about eighteen months to complete (early 2014)," Cameco said. It said that while future supply of global primary uranium production is uncertain, global consumption was quite predictable. "We believe that to fuel the more than 60 reactors currently under construction and the further growth we expect by 2021, production will have to come from new primary sources of production. In today's environment, those sources of production pose economic challenges, " Cameco said. Spot uranium prices have fallen by more than 10 per cent in the last year, due mainly to the closure of the nuclear power industry in Japan following the Fukushima disaster. Mr Gitzel told analysts that the recent restart of two reactors in Japan would "pave the way for more restarts." "We've also seen some Japanese utilities come into the market to contract for uranium. So we believe that these restarts are just the beginning and that these restarts, along with further restarts and new reactors coming online in China, and utilities continuing to return to long-term contracting, will help move the industry away from its current near-term uncertainty," he said. "When the market does move, it tends to move quite quickly as we saw in 2007, and again, in 2010. And the long-term fundamentals are there to support positive movement in the industry. 95 net new reactors are expected by 2021 and more than 60 of those are under construction right now."